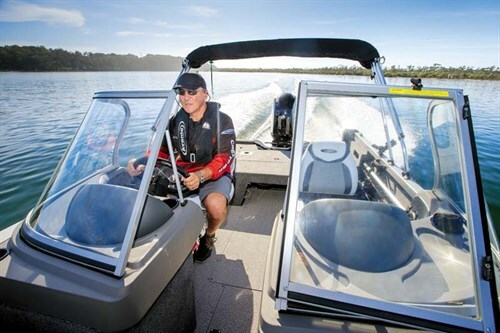 We water test and rate the Crestliner 1650 Super Hawk, a contender in the aluminium fishing boats category at the 2015 Australia’s Greatest Boats awards. Crestliner won the aluminium fishing boats category for 2014. With the 1650 Super Hawk, Crestliner returns with a new level of innovation and hull philosophy. When you come back to battle back-to-back places for the aluminium fishing boats and return top marks in the all-important Value for money criteria, equal top in Handling and ride, and only half a point short of 50 from the all-important X-Factor impression, you know that Crestliner is more than a real contender. It’s a downright hot favourite. It’s true, we wore quite some criticism last year by crowning an American-built fishing boat with line honours in the aluminium fishing boats division, especially when you consider the quality and diversity of our Australasian options. 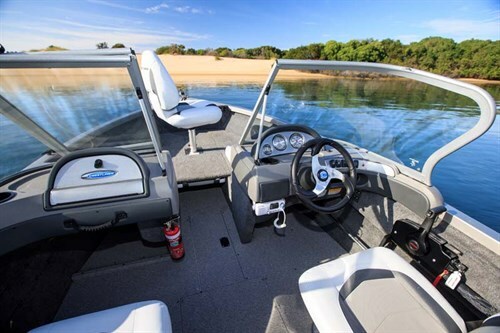 However this international-quality and highly innovative fishing boat comes to the country with a strong distribution and dealership network through Avante Marine and simply ticks all of the judges’ boxes. Australia’s Greatest Boats is truly a showcase of not only Australia’s best boats, but also those from the world market. 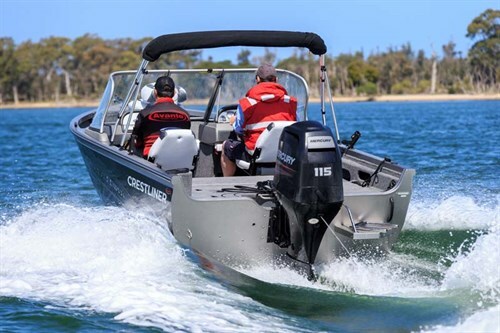 We have said many times that any boatbuilder would look at the specifications of the aluminium Crestliner boats with their moderate vee hull, broad beam and rather full entry and be very mistaken about their riding abilities. Quite simply we don’t know exactly what makes them work but on the water the Crestliner 1650 Super Hawk, as it is with every one of the products we have tested from this longstanding industry leader, just rocked our socks off. Let’s face it many alloy boats are famous for shaking your teeth out in the chop. Not the Crestliner. 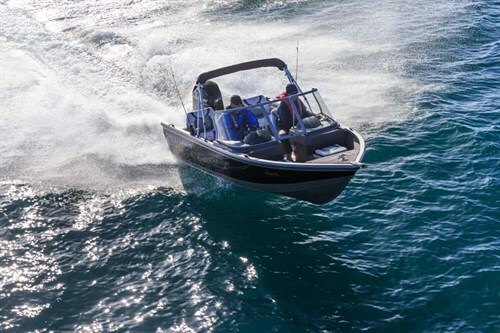 In fact this is the fishing boats brand that forced us to declare in a prior Australia’s Greatest Boats Competition that, "2012 is the year that aluminium boats equalled and in some cases, surpassed the riding quality of fibreglass." 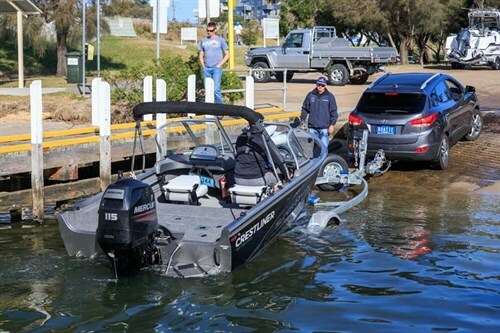 The Crestliner 1650 Super Hawk was the smallest fishing boat in this year’s field, but just like an AFL rover it was regularly seen running rings around the pack as it tussled with boats many times its weight and price tag. The internal fitout is superb, as is the external finish accentuated by a striking paint job and custom decals. This is a fishing boat that is within the reach of the family budget, that will not only please the clan but will thrill sportsfishos too. Crestliner is among the field leaders in our Innovation category with a unique convertible design, particularly with the fold-over rear seating that takes the whole tribe for a high-speed play or party one minute and then quickly folds down to reveal a full rear casting platform for the current rage of keen lure tossers. In fact its overall sportsfishing ability makes the Crestliner 1650 Super Hawk a tournament-standard fishing boat at a family-boat price. 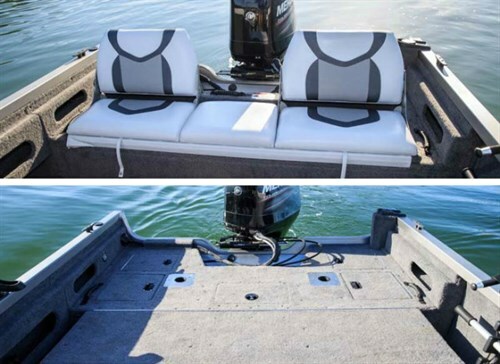 The boat has a terrific layout with its raised walkthrough windscreen, convertible bow platform that also transforms from seating to casting deck instantly, a series of kill and plumbed livebait tanks, innovative rod storage, comfortable seating with ergonomically pleasing helm and passenger facilities, and all finished in a beautifully trimmed and hard-wearing combination of carpet and decktread coatings. Our demonstration 1650 Super Hawk had the gutsy 115hp Mercury four-stroke outboard motor that speeds it along in a confident display of power. More so, its power-to-weight, propeller selection and fit-up height all seemed absolutely perfect, as it never slipped an inch as we powered into some playful aqua acrobatics! We said: "This innovative water-weapon is a highly-refined angling machine one minute, then an exciting sports bowrider the next. The 115hp Mercury four-stroke outboard motor provides a real Jekyll and Hyde character. It’s a silent stalker, capable of long periods of slow trolling, but also able to thrill the pants off the family during a watersports session." Crestliner boats has four American Consumer Satisfaction Index awards in the past four years and backs its product with a limited lifetime warranty, plus three years bow to stern coverage. That is real confidence in a product that has been developed by Crestliner since its beginnings in 1946! The Crestliner 1650 Super Hawk is easily towed by a family sedan and is presented as an impressive overall package by dealers Avante Marine. You should have seen the faces of the Lakes Entrance townsfolk, as well as the Trade-a-Boat crew and indeed, all of the competitors as we ran the gutsy little Crestliner 1650 Super Hawk over the daunting seaway and out to sea – it did it with ease. Well done Crestliner.